Bags of Love approached me to review an item from their website. At first I wondered, as you’d assume with a name like that it would be about bags (which isn’t a bad thing, but I wouldn’t be able to do just one picture), but looking at the variety of things on offer I was pretty impressed – there are bags, but there are lots of other things you can try – like wallpaper, cushions, bean bags, bedding, even. I particularly liked that there was a turnaround time for everything – which is always handy when you have to plan your days around being at home at a certain time. 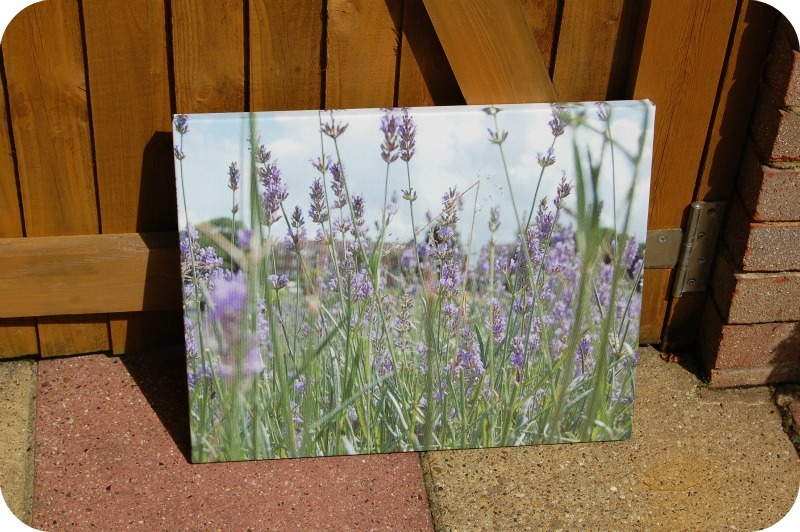 I took the safe option in the end though – and opted for a photo canvas. Our bedroom is a mess. A kind of organised mess, but a mess. We have a closet which really needs sorting out, and we have two sets of shelves in our room with my neglected vinyl collection sitting in it. On the walls live two discs I was given through work. On the other wall is an Ikea frame with various photos I got printed in them, but there’s no theme or organisation to our room, it’s a mish-mash of everything. It needs to look nicer and have nicer things in it. We recently did lavender picking, and the first photo I took worked really well – so I chose that. I placed my order with Bags of Love, and by 10am the following morning my canvas had arrived – I was extremely impressed with how quickly it was sent. I know my photo was a high-resolution one as it was taken on the posh camera, but seeing it, it’s even lovelier than I thought it would be – the purples of the lavender come out so beautifully. The picture has been on our wall for a few weeks now and I love it! You can find Bags Of Love on Facebook too. The canvas was sent to me free of charge for the purpose of review. All opinions are my own. This looks lovely, I am going to have to check out the website, though it looks a bit too tempting! It's VERY tempting – I'm waiting for christmas and my Christmas Club money I've been putting away at work to maybe splash out on something nice! My hubby made me a special throw from them for our second anniversary! It has key and random moments of our relationship from when we ere 16 till 2011! Good quality things! Aww! That sounds so lovely!